Nicolas Cage gets a bad rap, and perhaps Werner Herzog gets too good of one. On the one hand, rather than admit Cage underplayed his role (to great effect) in 2009’s science fiction drama Knowing, critics tended to harp on his haircut. Cage made a boisterous start as a young actor, and has been a prolific performer over the years. Before and after his Oscar-winning performance in 1995’s Leaving Las Vegas, he has balanced art-house favorites and mainstream, sometimes highly profitable films, for better or worse (no one is going to say the remake of The Wicker Man is a defensible film). If he’s made a mint with Disney, he’s also been in a number of critical darlings and given evocative performances in a string of films somewhere in the middle. It’s this Cage, the goggle-eyed, wildly gesturing madman found in films as diverse as Raising Arizona, Vampire’s Kiss, Wild at Heart and Snake Eyes that gets some of the best notices. Herzog has been in the business longer, and rightfully can be called one of the finest filmmakers of the past century. But when he turns to English-language narratives, something happens. Rescue Dawn, while a sturdy and well-acted film, felt like the result of another era. 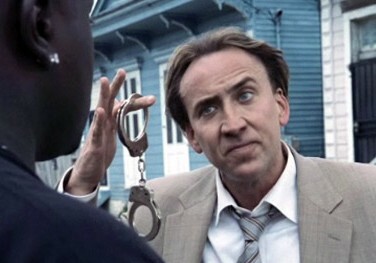 Similarly, The Bad Lieutenant: Port of Call New Orleans feels like a film made by someone who doesn’t know the language…English, or of film. It feels slapped together, disjointed and awkwardly acted. But Nicolas Cage gives another of those performances…so you know what you’re getting into. Lieutenant starts off just after Katrina has struck the titular city; flood waters are still high, and two detectives (Cage and a now-you-see-him-now-you-don’t Val Kilmer) are investigating a lockup where they discover a prisoner in danger of drowning. Cage’s cop has a change of heart and leaps down to save the man, but injures his back in the process. Months later, newly decorated Lieutenant McDonagh is a hero, but the extensive pain and pill use has created a lurching, hunchbacked, glowering creature as Cage shambles about in ill-fitting suits, a gun sitting awkwardly in his waistband. As his antics escalate, McDonagh puts himself, his lover (Eva Mendez) and a young witness at risk with dealers, loan sharks and various authorities. When he starts to see lizards and dancing souls on the job, it’s a wonder he can walk straight, let alone solve the case. And solve it he does! There is a moment late in the film when things start to come together for McDonagh, and it almost feels like a dream sequence. How can this guy actually get away with all the shenanigans he’s pulled off, unscathed? It’s just the perverse, giddy sensibility that both Cage and Herzog bring to the experience. But there are some sloppy elements that you wouldn’t associate with Herzog, or any seasoned filmmaker: a long, slow pan of the city skyline almost doesn’t start, and serves no purpose; characters drop in and out of the story as though the actors weren’t available and didn’t have the chance to film all their scenes; and the lead actor changes his accent halfway through the film, for no reason, and then reverts back before the final act. Though this last one just adds to the Cage mystique: he doesn’t stay in character, yet we’re mesmerized by him. The Bad Lieutenant… (the article in the title is not found in promotional materials, but was on the film I saw, so it sticks) is a strange combination of scenery-chewing bewilderment and generic procedural that buoys some rather slack filmmaking, but it manages to be completely engaging and often quite funny. It will be good to see Herzog get back to the wide-open spaces of global documentaries. And Cage? Whether we get Calm Mainstream Stalwart or Indie Maniac, Cage is always fun to watch.